Where have I been this past week, dear readers? I’ve left you stranded in the digital abyss without my witty rants. I’m sorry. I was away. Away at the Natural Products Expo in Anaheim, CA, observing the industry that is now encompassing me. It was an excellent show, really. We met with plenty of vendors and suppliers, learned a little bit more about the world of natural products and ate enough granola to satisfy an Santa Cruz-born hippie for weeks. In all, highly productive for us. But of course, I left you hanging. 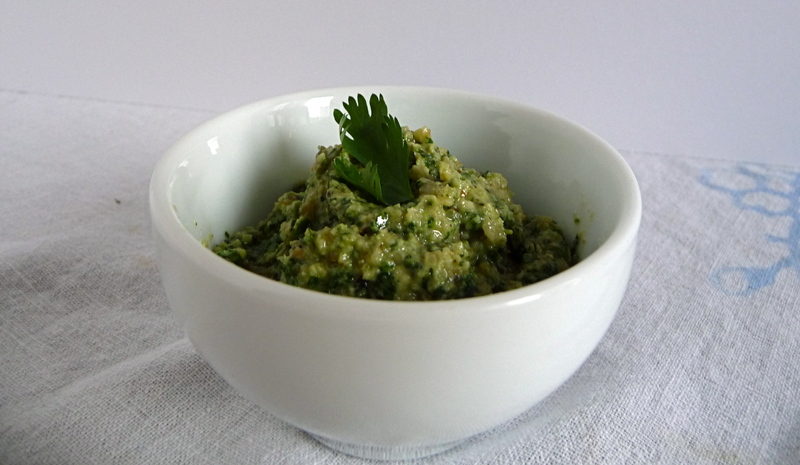 So let me woo you again with a lovely Cilantro Walnut Pesto. Start with a nice bunch of fresh cilantro. Do yourself a favor and never buy it in the plastic cartons at the grocery store. Go to the produce section and get a proper bunch. You’ll save a few dimes too. Next, toast up some lovely walnut pieces until your kitchen smells nice and nutty. Blend the washed cilantro with the toasted walnuts, a drizzle of olive oil, salt, pepper and lemon juice. You’ll end up with a divine, totally different sauce to put on pasta, beans or as a condiment on toast. First, toast your walnut pieces in a heavy bottomed skillet over a medium flame. Use a wooden spoon to constantly move around the pieces for 2-3 minutes until your kitchen smells nice and toasty. Don’t walk away! They will burn in the blink of an eye. And then you’ll be sad. You may even cry over burnt walnuts. And we don’t want that. Place your freshly toasted walnuts in a food processor with the freshly washed and dried cilantro, lemon juice, a dash of salt and a few cracks of pepper. Get the machine whizzing for about 30 seconds and then start drizzling in the olive oil slowly. Feel free to add more olive oil if you’d like a slightly thinner pesto. Makes a about 3/4 cup of pesto, depending on how much oil you use, which is perfect for about 4 servings on a main dish. I used this pesto on some roasted root vegetables, and they would be lovely in any recipe that uses traditional cilantro. Freeze what you don’t use within 2-3 days.